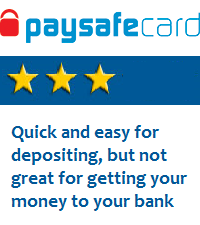 PaySafeCard is not really a card at all, it is more like an eVoucher system. It works perfectly well though, and you can use it as a virtual debit card. In essence, you purchace PaySafeCard credits where ever they are sold in the real world, and then use those credits to buy things online, or to deposit to your favorite poker site. When you buy your card in the shop or other outlet, you get a four digit PIN number. This number contains your credit amount. You use that number when depositing to poker sites. You can also buy cards online. For details see the PaySafeCard Site. The minimum value card you can buy is €5.00. They also have a list of locations of stores where you should be able to get these cards in your country. Or if you prefer you can get an app that will locate stores for you. This service is quick and convenient, but it is not highly recommended for the simple reason that getting your money back from you card is costly ($7.50 fee applies) and it can take up to three weeks for the money to reach your bank account. While poker deposit limits are quite low using this method, they are not as low as some other methods, such as Skrill. In short, if quick and hassle-free is what you are looking for then this is a great option. But for managing your online bankroll, there are better options. CoolHandPoker actually say that they have no minimum amount when depositing using PaySafeCard. I guess in that case it would be 1 penny or 1 cent, though it is hard to imagine making a deposit for that amount. I have it in the table as £1.00, as that makes more sense. You can go to That poker site here. The set up process is as quick and simple as you could want it to be. Once you buy your card – PIN number – your money is stored in that card and can be used anywhere that accepts payments by PaySafeCard. You don’t need to verify your bank account or other details. However, for poker players, especially profitable ones, there are some things that you should be aware of when choosing to use this deposit method. Transferring funds to poker rooms from you card is quick and easy. Even transferring your winnings back to your card is relatively easy and painless. But getting those funds back from your card into your bank account can be costly and time consuming. The idea behind these cards is that the money will be spent, and they are not really designed for the movement of money, like the other payment processors are. To withdraw the credit from your card and turn it into cash in your bank account, you will need to send the card details, along with your bank details and proof of identity, to the people at PaySafeCard. This costs $7.50 and can take up to three weeks. An easier way to manage your funds with these cards is to find a poker room that accepts deposit using this method but is happy to pay out using a different method. Alternatively, you could open a Skrill account, and use the card to fund that. That would be the best option, the only question being why you didn’t do that in the first place. Using these cards can be quick and convenient. If you use more than one card, you might want to take a bit of time and set up an account with the PaySafeCard website. They offer a members section, called My PaySafeCard where you can see the balances on any cards that are registered to you. The real benefit with this payment method is that it is quick and easy. Further to that, if you want it to be so, it can be the most anonymous way to use money online. That doesn’t really apply much in online poker terms though, as you will be funding a non anonymous poker account. But I guess you could use the funds on the card to fund any online poker account, should you wish to do so. Quick, easy and convenient – provided you are near an outlet in the real world where you can buy these cards – PaySafeCard is a viable payment option for online poker players. For players that create a My PaySafeCard account on their site, they offer a rewards program where you can collect points and so on. You can also buy cards online, though that defeats the purpose of these cards a bit. If you have a way to pay for these cards online, you could probably use that method to make your poker deposit. Other than those benefits, we were unable to find any promotions or bonuses that apply to this method. I have never used this payment method, so I cannot say how good or bad their support is. They do have a useful collection of FAQs on their site here https://www.paysafecard.com/en-gb/help/. That link takes you to the English language page, but the site is available in about forty different languages. If you should need to contact the support staff they have an online form here https://www.paysafecard.com/en-gb/help/contact-form/. If you prefer email, then the address to use is info@paysafecard.com, or, if you are in the United Kingdom, you can call 0800 051 7162 which is charged at local rates.